IS2T, MicroEJ(r) embedded Java solution provider, and ARM have started collaborating on embedded software development to enrich both companies tools and added-value software stacks. Nantes - France, 9th August, 2013 – IS2T, MicroEJ® embedded Java solution provider, and ARM have started collaborating on embedded software development to enrich both companies tools and added-value software stacks. The integrated MicroEJ® + MDK-ARM™ offer is available from IS2T added as an authorized reseller by ARM. This CMSIS compliant solution supports low-level driver development and enables customers to reuse their existing C or Java code. MicroEJ® is a runtime Java platform including MicroJvm®, the industry’s fastest and smallest Java virtual machine, and a collection of libraries such as Embedded UI to design appealing Human Machine Interfaces (HMI) on a wide range of cost effective microcontrollers. Only 28 Kbytes of code memory (flash) and less than 1.5 Kbytes of RAM memory are required to run the MicroJvm® virtual machine. 90 Kbytes to 140 Kbytes of code memory in total are necessary to run a fully functional, advanced Human Machine Interface. MicroEJ® also provides an instant simulation and prototyping platform to debug and test binary code. The Keil™ MDK-ARM development kit combines the state of the art ARM C/C++ Compiler, the µVision IDE and debugger as well as advanced trace functionality. MDK-Professional Middleware libraries provide excellent support for the sophisticated peripherals used in modern microcontrollers. 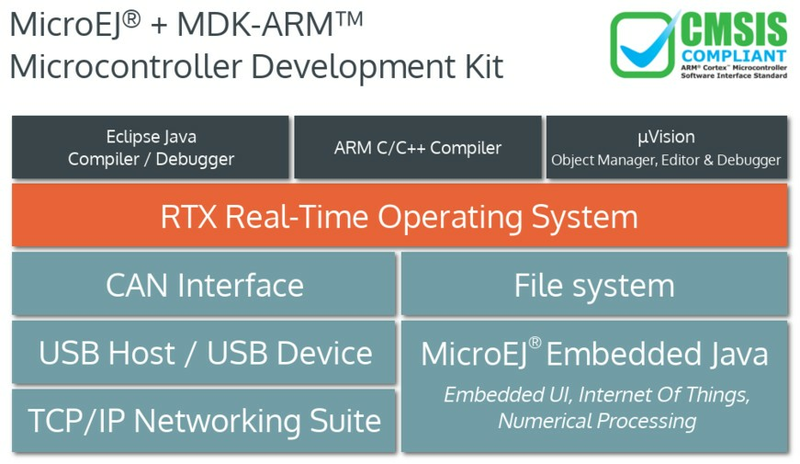 MicroEJ® + MDK-ARM™ allows to develop hardware drivers, to use ARM stacks RTX RTOS, TCP/IP, USB, FileSystem, CAN, and to allow existing C/C++/Java to collaborate within embedded applications. Java™ is Sun Microsystems’ trademark for a technology for developing application software and deploying it in cross-platform, networked environments. When it is used in this document without adding the “™” symbol, it includes implementations of the technology by companies other than Sun. About Keil: The Keil products from ARM include C/C++ compilers, debuggers, integrated environments, RTOS, simulation models, and evaluation boards for ARM, Cortex-M, Cortex-R4, ARM7™, ARM9™,8051, C166, and 251 processor families. About ARM: ARM designs the technology that lies at the heart of advanced digital products, from wireless, networking and consumer entertainment solutions to imaging, automotive, security and storage devices. ARM's comprehensive product offering includes 32-bit RISC microprocessors, graphics processors, video engines, enabling software, cell libraries, embedded memories, high-speed connectivity products, peripherals and development tools. Combined with comprehensive design services, training, support and maintenance, and the company's broad Partner community, they provide a total system solution that offers a fast, reliable path to market for leading electronics companies. More information on ARM is available at www.arm.com.